In this article I will discuss the merits of a single word—‘little’—which proves to be a useful sequence of letters for practising a number of key aspects of the Spencerian family of scripts. I will explain what I like about the word, and I’ll go through each of its challenges in detail. In the process I will often refer to the classic Spencerian theory, even though my own writing focuses more on the two derived styles Business Penmanship (BP) and Ornamental Penmanship (OP). It's just that classic Spencerian is extremely well defined, and I've found that its concepts and nomenclature still apply very well to the BP and OP practice. What makes 'little' so special? After having worked on my BP and OP on and off for almost a year I noticed there was something about my script that kept me dissatisfied. It had something to do with the overall look, and it was clearly something structural, but I couldn't put my finger on it. Others also seemed to be unable to tell me what it was that was missing. After a lot of experimenting it occurred to me at one point that I had the tendency to make my Principle 2 strokes too straight. I also noticed that executing this stroke well with muscular movement technique didn't come entirely naturally to me. Spencerian Principles. Source: New Spencerian Compendium (1879), Plate II. Remember that the Principle 2 stroke is a slight upward curve—the entry and exit stroke of the minuscule i. But it's also the stroke that starts and ends the l, the t, and the e. When you put t and l side by side, you can see how closely they are related, the l being just a bit taller and requiring some added lateral motion to create the loop. The letters e and i are arguably even more closely related, as I will explain below. So, any word consisting of a combination of the letters l, i, t, and e is therefore very useful for building consistency because the movements we use to produce them are essentially the same, with enough variations to keep the repetition from becoming monotonous. Furthermore, 'little' is one of the longest, most commonly used words that employs this combination of letters. Let's analyze 'little' in detail to see what it has to offer as a practice word. The word 'little' begins with an ascender loop. In the classic Spencerian theory, this stroke is assigned its own Principle (i.e. number 4). However, there are multiple ways of approaching the execution of the ascender loop, and one that I very much like for the purposes of this article only considers the portion between the baseline and the x-height line. When you cover the portion above the x-height of l, (the loop) you should be able to see a perfect i. Remembering that the i is constructed as Principle 2 + Principle 3 + Principle 2, it is easy to understand the l as beginning with a Principle 2 stroke. For me, the challenge with the P2 stroke is to keep it well curved. Although in the classic Spencerian style it is in fact curved only very slightly, I have come to the conclusion that curving it well nonetheless, greatly improves the grace and elegance of my script. It also makes it easier to read because of the increased contrast with the Principle 3 stroke, which is the ‘overturn’, or entry stroke into, among others, the minuscule n. My method of curving it well is to remember to start the stroke quite horizontally, aiming for the main slant around the x-height. In the case of the l, even with the increased lateral movement required for the loop, I find that aiming to reach the main slant as quickly as possible increases my success rate considerably. 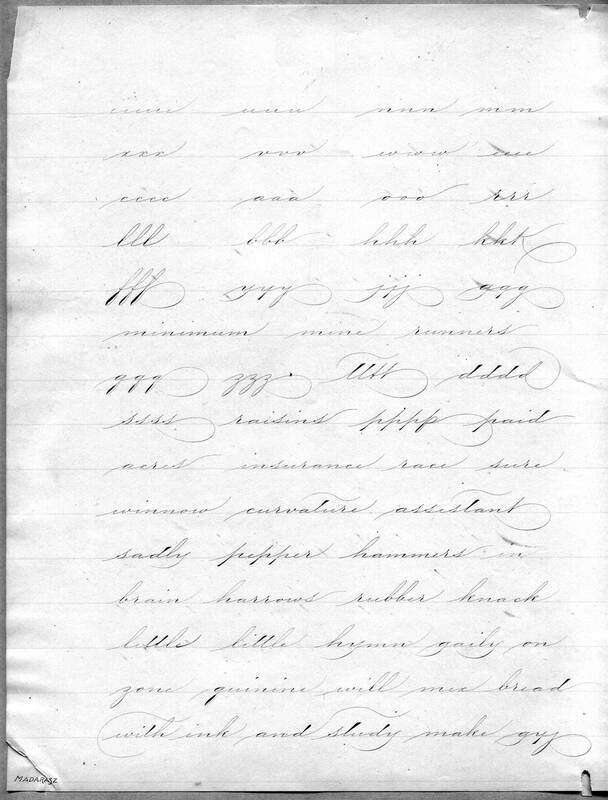 Spencerian Minuscules. Note how the lower 1/3rd of the l is exactly an i. Also see how the five ascender loops in this plate all come down left of the main slant line. Much can be said about loops, possibly enough to fill a separate article. In short I like to follow what is shown on Plate II of the New Spencerian Compendium (1879), the two versions of Lessons in Ornamental Penmanship by C.P. Zaner (1920) and P.Z. Bloser (1948) respectively, and what is explained on page 70 of the incredibly detailed instruction book Manual of Penmanship by Payson, Dunton, and Scribner (1873). What they all have in common is the idea that a loop curves around the main slant on both sides. I try and achieve this by going up and down along the main slant, while mixing in a little (no pun) bit of lateral motion. A number of loop letters as defined by P.Z. Bloser in his Lessons in Ornamental Penmanship (1948). Note how the loops all curve around both sides of the main slant. Curving my Principle 2 stroke well helps me to cross the upstroke at the right height when coming back down. Without this, I have the tendency to cross my ascenders too high. Crossing right by curving well. In all four different letters of 'little', the transition from the downstroke to the P2 exit stroke is executed as what Del Tysdal calls the corner curve. This is a difficult turn to make as it is easy for it to end up being either too curvy, or too edged. What seems to help me is waiting as long as possible before starting the exit stroke. Still I find it quite hard to really keep the downstroke nice and straight below the x-height line. Fortunately, in 'little', the corner curve occurs six times in a row, so there are plenty of opportunities to get it right eventually. This is generally the first letter taught in many textbooks, including ones on scripts outside the Spencerian family. The main challenge with this letter as it occurs in our practice word is to not make it too tall. Especially when, like me, you write without guide lines, it takes some deliberate practice to keep the i at the x-height after the extreme swing of the preceding l.
Like the previous letter, one important challenge with the t is to hit the right height. Depending on the letter height proportions you adopt, this is somewhere between the height of the l and the i preceding it. Another thing to keep a close eye on is the height at which the entry stroke touches the downstroke. Ideally, this happens around the x-height. Again, curving the entry stroke well and trying to reach the main slant as quickly as possible helps me to achieve this. Obviously, the second t should look the same as the first. Pay special attention to height, slant, entry stroke, and corner curve here. Louis Madarasz, two attempts at 'little.' Note how horizontally the master starts his P2 strokes. Source: IAMPETH. There is basically no reason to execute the second l differently than the first one. However, the variations in the letters in between will have broken much of your ascender looping ‘flow’ by the time you reach this second instance. Here it helps to truly feel how a loop is essentially a long P2 + P1 sequence, with just a bit of added lateral motion. This way you can take advantage of the flow of the previous letters even though they are not loops. Don't forget to watch the slant and the height of the letter carefully. Edward C. Mills suggests 'little' in his course Ideal Business Writing —The Business Educator, May 1925. In The New Spencerian Compendium Plate II, e is explained as a P2 + reversed P3 + P2 stroke sequence. I guess there are also alternative ways to look at the letter, maybe more as a short l, or perhaps as a more rounded form. Whichever way you look at it, there are again the two P2 strokes that really benefit from being executed with a nice curve. Around the baseline, many methods prescribe the same corner curve as found in the preceding letters, and when working on consistency in 'little', I think it is a good plan to adopt this. This 'little' was penned by Mary L. Champion for the Champion Method of Practical Business Writing (1921). The word 'little' has a very interesting stroke sequence, which lets you practice the P2 + P1 + P2… cadence with many variations within the same word. The word encourages building consistency in the under turns, corner curves, and downstroke slant, without the writer slipping into mindless practice. Additionally, it is a great word for building inter-letter spacing, and learning to maintain vertical letter proportions without the use of guide sheets. Earl A. Lupfer, 'little' in his course Modern Handwriting Correlated with Commercial Subjects. The Business Educator, April 1929. Personally, I very much like the word 'little' as a practice word, and I find myself returning to it a lot. With this article I hope to have explained the reasons why, and what I think you can get out of practising it. If you have a favourite practice word yourself I would love to hear about it! So please feel absolutely free to leave a comment. Alexander van den Bosch is a software engineer and a father of two, living in the Netherlands. He started to work on his handwriting in December 2015, and in the process he got severely bitten by the penmanship bug. Alexander is particularly passionate about America's Golden Age of Penmanship, and loves to study and practise the Spencerian family of scripts. His practice focuses strongly on classic writing technique, and he loves to share everything he comes to understand on the topic. Alexander has created a set of Spencerian worksheets which can be downloaded here free of charge.